When most people think of HootSuite, they think of a revolutionary platform that allowed people to schedule their tweets before most of the other social media post scheduling services were available. HootSuite set the example for others to follow, and now thousands of social media post scheduling tools are on the web. Most people use HootSuite for just that: scheduling tweets and social media posts for other accounts too. Within the basic, popular capability of scheduling tweets is an entire dashboard that allows you to find the exact content you are looking for and use social media in an effective manner. It wasn’t until I became a HootSuite Ambassador when I finally considered using this dashboard, but if you are not using the dashboard, then you are not getting the full value out of HootSuite. 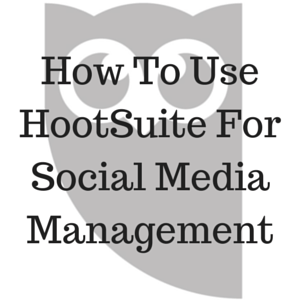 HootSuite is a valuable tool for your social media strategy, but it is also a valuable tool for your productivity. The well-known advantage of HootSuite is the ability to send and schedule multiple tweets on the same platform. You can schedule a tweet for your Twitter account and send a Facebook post with the same platform. This HootSuite feature encouraged me to create another Twitter account which I am actively growing. The ability to send one tweet from my main account and some tweets for other Twitter accounts that I am building from the ground up on the same platform is game changing. Without HootSuite, I would have to log into each account, send some tweets while logged into Twitter, log out of each account, and repeat the process until I successfully sent some tweets from all of my accounts. The time I save by scheduling tweets from one platform is nice, but that’s how most people see HootSuite: a time-saving app for scheduling content. Now, I will discuss the dashboard, how you can use it to find the content you want, and how you can save more time on it. The tabs on HootSuite work like tabs on an internet browser. Chances are you may have some tabs on your browser as you are reading this blog post. Let’s say that one of those tabs is Twitter. Once you are done reading this blog post and want to move onto something else on the web (my feelings aren’t hurt), you may simply click on the tab you already had opened that leads you to Twitter. HootSuite’s tabs work just like that. You can have Twitter searches and lists for a specific area show up on one tab. You can have your scheduled tweets, sent tweets, and mentions on another tab. One of your tabs can contain stuff relevant to your social media strategy while another tab can contain a bunch of random facts tweets. My recommendation is to only use tabs related to your niche. I have tabs that show me tweets of articles about blogging, Twitter, and social media in general. Each time I click on one of these tabs, I get to see specific information that I was looking for. When you add something to a tab—your scheduled tweets, your mentions, a Twitter search for a keyword, your Instagram account, or anything else—those are called streams. Streams fill up your tabs with valuable information that can help inspire your next blog post idea, increase your knowledge in a certain area, or fill you with motivation. The huge difference between using HootSuite and using a social network on the actual platform is that there are fewer distractions. On Twitter and Facebook, it is easy to get caught up in the trending topics and your friends’ posts. On HootSuite, those two options don’t exist. HootSuite does not show the trending topics, and the only way to see your friends’ posts on HootSuite is if you include a special tab for all of your friends’ posts (not recommended because that can eat up a big chunk of your time). You can rest assured that all of these streams will get updated with the newest content. HootSuite gives you the option of a manual refresh (not recommended. You must click the refresh button for the refresh to occur) and the option of automatically refreshing all of your streams every 2-30 minutes. The automatic refresh option allows your tabs and streams update in real-time just like social networks do. HootSuite Pro opens you up to new features provided on the platform, and one of the top features is the bulk scheduler. The bulk scheduler allows you to upload a CSV file of prewritten tweets (Numbers for Apple users and Microsoft Excel for other computers) under their easy-to-follow format. The bulk scheduler allows me to save an easy 10 hours per week. Manually scheduling 100 tweets would take me two hours, even with copying and pasting from a document of prewritten tweets (I did this when I manually scheduled tweets). Sending the same number of tweets with the Bulk Scheduler only takes six clicks. The bulk scheduler is great for people who send tweets in a cycle. I am totally okay with admitting that I tweet the same thing more than once. In fact, I have probably tweeted about some of the same tweets over 100 times. How do I have so many followers then? The answer is that I space my tweets by several days, and all of the tweets provide the right value for my targeted audience. It is entirely okay to tweet the same things over and over again and still gain hundreds of daily followers. I’m not the only one who sends out repeat tweets. Some of the top experts follow this same approach. When you get HootSuite Pro, you can now add more than five social media accounts to your HootSuite account. This makes it easier for you to manage all of your social media accounts, and if you plan on creating numerous Twitter accounts, then this feature will be very beneficial for your strategy. All of your social media platforms in one place. That’s the best way to operate your social media strategy on the busy, noisy web. HootSuite was voted as the #1 Social Media Tool in 2014 for a reason. Not only does HootSuite make scheduling tweets a breeze, but HootSuite also makes it possible for people to use their social networks in a more productive manner. I love using the tool, and I use it every day for scheduling tweets and staying up to date in my niche. I may be a HootSuite Ambassador, but I did not come armed with an affiliate link, and this article was not written for any compensation. I viewed HootSuite as a wonderful tool well before I became one of their Ambassadors. What are your thoughts about HootSuite’s capabilities? Do you have any tips for using HootSuite? Do you use HootSuite teams feature? Please share your thoughts and advice below.